Handmade with shea butter, palm oil, olive oil, coconut oil & lavender Essential Oil! Nice Clean Lavender fragrance with great Lather * Available while supplies last. 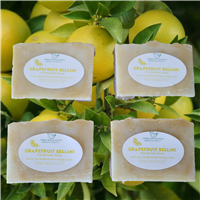 *Soaps are handmade and may slightly vary from photo. See additional photo variations of our lavender soaps. *Cost is per one bar of soap! Handmade with shea butter, palm oil, olive oil, coconut oil! Nice Clean fragrance with great Lather * Available while supplies last. *Price is per 1 bar of soap. Handmade with shea butter, palm oil, olive oil, coconut oil, mint leaves, & Peppermint Essential Oil! Minty fragrance with great Lather *Cost is per bar. Handmade with shea butter, palm oil, olive oil, coconut oil and oatmeal. A nice almond and oatmeal fragrance! Great Lather. *Price is per 1 bar of soap. Handmade with shea butter, palm oil, olive oil, coconut oil! Nice Coconut Lemongrass fragrance with great lather! Available while supplies last. Handmade with shea butter, palm oil, olive oil, coconut oil! Nice Coconut fragranced soap with great lather *Cost is per 1 bar of soap.